Donated to Te Omanga Hospice for their Vintner’s Lunch fundraiser in July 2018. Version 5 or so of this view from my ex-office window with the world and all its weathers going by, very distracting. Early morning I think, not that I’d know much about that. The hills and reflections were completed in late 2016, then decided that I liked the sea and sky in white per the gesso on the canvas instead of turquoise and blue as planned – so it got put aside while I took 6 months or so to agree with myself!!! 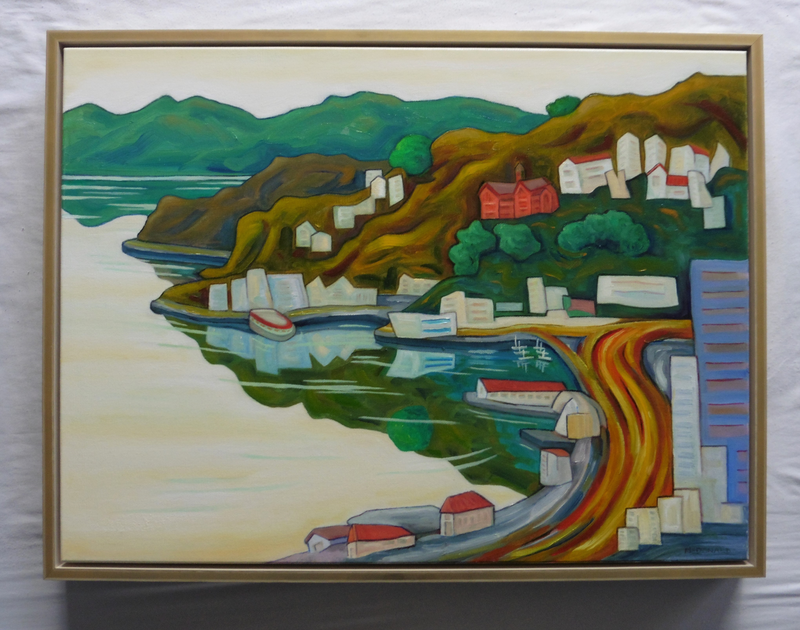 The frame was generously donated by Dean Walker of Affordable Framers, Whitby and the profiles by Olsen-Juhl NZ. Needs a bit more depth in the sky and sea even so – funny how seeing it digitally does that, yet also need to avoid over-fiddling!